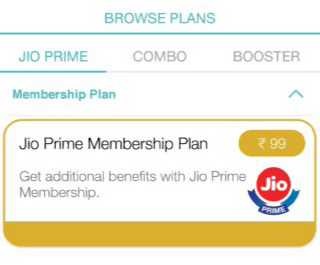 Reliance has launched its latest Jio prime member Plan 149, 303, 499, 999, 1999, 4999 and 9999. We have already posted how to activate Jio Prime membership on your phone number. Check out how to get these latest plans on your 4G devices. Jio Rs 149 Prime Plan: You get 2 GB data, unlimited voice calls, and 100 SMS with 30 days of validity. Jio Rs 303 Prime Plan: You will get 1 GB data daily(unlimited data between 2 am to 5 am) with unlimited voice calls, free Jio services, and SMS for 30 days. Jio Rs 499 Prime Plan: 60 GB data with no daily limit(unlimited data between 2 am to 5 am), free Jio services, voice calls up to 30 days. Jio Rs 999 prime plan: 60 GB of data with 60 days validity. 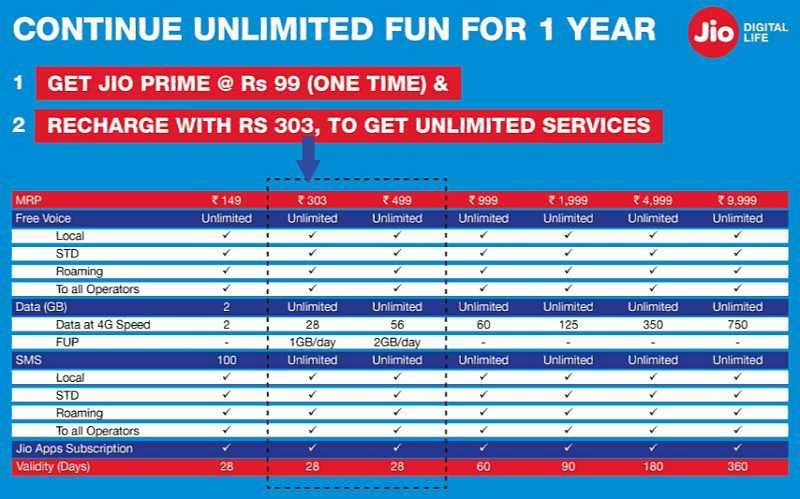 Jio Rs 1999 prime plan: 125 GB of data with 90 days validity. Jio Rs 4999 prime plan: 350 GB of data with 180 days validity. Jio Rs 9999 prime plan: 750 GB of data with 360 days validity. Sign in with your Jio number. Click on recharge option in the home screen. Now select Jio Prime Membership Subscription. Pay Rs 99 via JioMoney, Debit Card or Net banking. After successful recharge, you’ll become a Jio Prime member. Also, you will get access to all current and upcoming Jio services (Broadband, DTH and more) if you subscribe to Jio prime before March 31, 2017. Jio prime postpaid users will also get the same above-listed plans.